High speed cameras are now mandatory in the film and television industry. Some decades back, one had to sacrifice high resolution images for super slow-motion shots. However, due to advancing technology, high-speed cameras are increasingly being used to televise sports events, shoot spectacular movies and documentaries in full HD. Hardly any sector has in current years developed like the industrial image processing sector. Because of an ever-continuous development of imaging sensors and greater computational power, image processing systems have actually become very potent in performance. Considered some few years ago as virtually priceless, broadband video cameras are now budget-friendly and cheaper to produce. Today, high speed cameras can process up to 2000 pictures per secon in high resolution and thus, are hardly to be ignored in image processing and analysis. Whether in collision tests, movement analysis, error detection in production, organisation-intern material and quality control, high-speed cameras can catch every close-up detail. One of the market leaders in the field of high speed cameras is PCO AG in Kelheim, Germany. Their main high speed camera pco Dimax S allows an astonishing frame rate of up to 2200 frames per second with a full resolution of 1920 x 1080 pixels. This digital CMOS camera system is suited for material testing, impact tests or super slow-motion shots. Individually designed and combined with proprietary algorithms, the CMOS chip produces high quality images in dark or low light conditions with no discernible noises. The FASTCAM IS-1M by Photron, a U.S company, offers up to one million frames per second. The camera is equipped with a high-sensitivity CCD sensor which is suitable in taking shots of high-speed phenomena, such as the analysis of fuel combustion or forensic ballistics. 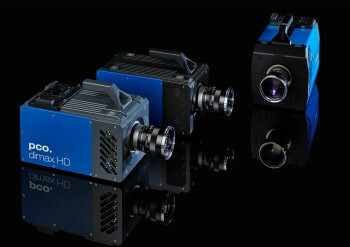 Another company Vision Research, recently introduced a new slow motion camera called Phantom Flex 4K. This new camera can record high speed images up to 1,000 frames per second with extremely high resolution at 4096 × 2304 pixels (4K industry standard). The Marmalade, a company in Germany, has developed a robotic arm on which high-speed cameras can be mounted to shoot images in real life sequences as opposed to the quasi-static nature of current high-speed cameras. Spike, as this system is called, will open up entirely new ways of shooting breathtaking videos of fast moving objects. Innovation in this field is ongoing. The scientific world, movie makers and regular customers should be excited about the next generation of high speed cameras. For more exciting high speed videos visit our video section of VISION 21XX.